Display ITU-R BT.1729 and BT.471-1 colour bar with small moving element (bouncing ball) as mentioned in CISPR 32 / CISPR 35 EMC standards. It may play 1 kHz tone, too, when loaded on Chrome, Firefox and similar browsers. For the traditional scrolling Hs, see scrolling-h. 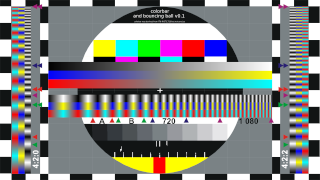 These colorbars (test patterns) were derived from ITU-R BT.1729, but they are not accurate. SVG versions are scalable and may give best result on any screen resolutions, but, unfortunately, it seems some web browsers doesn't display it correctly. If it doen't work, use rasterized PNG version instead or try use other web browsers. See also Tested Browsers for the browser compatibility test results. If you couldn't run it or you had performance problem, try another web browser such as Chrome and Firefox. As a final resort, you may try MP4 video and animated GIF version above. These files are in the public domain, and are provided "as is" without warranty of any kind.